Yesenia Pedro Vicente was born and raised in Morganton, N.C. where a prominent Guatemalan Mayan immigrant community is well established. Vicente was raised speaking Spanish - as opposed to her parents’ native language, Q’anjob’al - which is why she feels compelled to identify as Latina. She explains the difference between various identity labels that are used by fellow Guatemalans in her hometown. The terms Latino and Hispanic (a term created by the U.S. Federal Government, used in censuses) are two examples of identity labels that Vicente explores. She discusses the meanings of these two terms, elaborating on her personal usage of them and the ways in which she prefers to identify herself. Vicente goes into some detail about how she fits not into one culture or label, but three. She also touches on the colonial past of Latin America, explaining the struggles that Latin Americans have experienced since the beginning of the Spanish conquest. She explains that Latinos would do well to unite under a common identity so as to elevate themselves along their journey toward decolonization. The last portion of the interview contains her opinions on the influence that Mexican culture has had on Latino identity in the U.S., as well as how religion plays into it. Joël Hage: This is Joël Hage interviewing Yesenia Pedro Vicente in the FedEx Global Center at the University of North Carolina at Chapel. It is the afternoon of April 11th, 2013. It’s approximately 5:00pm. All right, Yesi, let’s go ahead and get started. When people ask you where you're from, what do you say? Yesenia Pedro Vicente: I say that I - I say that my parents are form Guatemala and then I say, but I was born here. So I think the first thing that comes to mind to me is that - I don't know, I affiliate with what my parents are and so I say Guatemalan. But then I do clarify that I am American – that I was born in America. JH: Okay. Thank you. And then, how do you identify here in the U.S. compared to how you - I think you've only been to Guatemala once, right? Twice, okay. So, how do you identify here in the U.S. compared to how you identify in Guatemala? YV: So in the U.S. I do identify as Mayan or Latino. It depends in which context I'm in. Usually I found myself that in the academic context I am Mayan, or even back home in my church community I am Mayan. It is once I am surrounded by other students that come from Latin American countries, where if I'm talking about a broad spectrum, just in general talking about people from Latin America[n] descent, that I then group us all into Latinos because there is a certain, in my opinion - there is a certain Latino experience that I think is shared amongst people that speak Spanish or are of Latin American descent when you're growing up in America. I - this is kind of a joke - but there's a Twitter account that's called "Latino kid problems" and sometimes I'll look at what they put up there and I resonate with what they say, whether it be a Salvadorian or Mexican person who Tweeted something about it. And I laughed because I - you know - I find myself being like oh yeah that happened to me too. So there are certain things that when you put people of Latin descent in America, that makes you kind of unite because of that Latino identity. But then when I'm back home, and it's very much just a Guatemalan Mayan population then I realize oh I am Mayan and everyone here is also Mayan. Whether they speak a different language or not, it doesn't matter because we also share very much like the same foods and even though the traditional dress is different, the cut of it, the corte, the blusa, it's all the same. JH: So, looks like you were already leading into my next question which is what does the term Hispanic mean to you? And just a heads up, I'm going to ask you in a second also what the term Latino means to you. So, just make sure you can distinguish between those two. YV: Can I say that I forgot to answer the first part of your question, even, which was how I identify in Guatemala itself? I'll make it brief, but - when I'm in Guatemala though, I'm very much more American than Guatemalan if that makes sense. When I spent this summer with a host family, they - there were times where we got along well, and like, I understood a lot of the references that they knew in terms of pop culture, the food, or just having, you know, tortillas at every meal. But I could tell, even with my own education and the type of music I listen to and the style of clothing that I wear, that it's more American. And so my host mom joked one day that she's like, "O, eres como una gringa." And then she laughed and she's like, "No, pero, no exactamente." So I'm kind of in this in-between where if I'm placed in a Guatemalan context I'm more American than Guatemalan in the country itself. But when I'm here, I'm not exactly American, and so then I identify as Mayan when I'm at home with my community or Latino if I'm surrounded with other peers that speak Spanish. YV: Okay. Now for your second question, do you mind repeating that? JH: Yeah, so what does the term Hispanic mean to you? YV: Hispanic means to me - that's actually a definition that I didn't really solidify until a couple of years ago when I came to UNC. And that's through a Spanish class where my professor asked me, you know - well he asked the class, you know, "What is the difference between Hispano y Latino?" And I thought, oh, they're the same thing! And then he made a definition that I actually very much agreed with because it made sense in my mind, but Hispano is someone who has Spanish descent. And so, they can be from the actual peninsula of Spain or they can be in Latin America but just have - I guess in my mind - have maintained some kind of Spanish heritage or lineage and have kept those Spanish names and maybe even married within each other. And that's something that I've realized, is that there are some people living in Latin America that very much look European, you know, or white if I want to be blunt with it. Where they have - I mean, I met this one kid, honestly, at a finalist weekend, who - I forget his first name, but his last name was like Vasquez, or something - and he said it with a Spanish accent, not "Vaz-kwez" or "Vaz-kez", but Vasquez, and I was like - I walked over and I said, "You just spoke with a Spanish accent," you know, "where are you from?" or "do you speak Spanish?" And he said, not the most nicely - he was a little arrogant - he was like, "Oh, I'm Guatemalan." And I was like, "Oh me too!" But I was shocked because he was pale, blue-eyed, and blonde, and I just did not expect that. That's the complete opposite of what my version of Guatemalan is, where I'm tan, dark-haired, dark eyes. And so I had a bit of a, like a shock, and I had one of those moments where I thought, like, okay so we're both Guatemalan, but it just made me realize, like, he's Hispano because he very much has maintained the Spanish name and apparently his family has stuck, like, within their Spanish circle within Guatemala. And my family is indigenous and so we would be Mayan. But, to answer the next question, what is Latino then, I would say a Latino is a person who was born in the U.S. and then grew up in America, shaped by this context of just being other within the U.S. and not being American per se, not being white or even African American. So I generally tend to picture that as Latino - is someone who's grown up here but belongs to a Latin American race. And I think that would - then when someone immigrates here, I would say that they're - because they've spent the majority of their life in a different country, then their identity is more of that country, and so then I accept that you're Salvadorian or you're Honduran. And that's where I think the specificity comes from - is when you hear someone say, "Oh, I'm Honduran" or "I'm Colombian." And if they've actually grown up most of their life there, I think that's pretty valid because that's what you know and that's what your identity is. If you've grown up in America, I think your - your identity is shaped by having been raised in America. JH: So, if - I would just like to clarify. Would you say that people in South and Central America that don't necessarily speak Spanish as their native tongue, just like your family - that those people, when they're living in the U.S. they are Latino regardless of their culture, regardless of their religion, regardless of their language? It's the fact that they come from Latin America. YV: If they were born in the U.S..
YV: Yes, I think [laughs] regardless of whether they speak Spanish or not. That makes it tricky because I hadn't thought of that because I tend to classify most of Latin America as Spanish-speaking even though I recognize that Brazil and even Guyana or any of the other countries do not speak Spanish. Oh, that's interesting! JH: Well, just out of curiosity, because yourself, you're a perfect example of this. You speak Spanish as your first language, right? But your family doesn't, so even though you started speaking Spanish as your first language here in the U.S., you technically would have started speaking your parents' language before that. So would you have - in that case - would you have considered yourself Latina? Do you see what I'm saying? YV: I do. I do. JH: Because you kind of fall in the same category. YV: I think that speaking Spanish makes me Latino. YV: If I had grown up and had never learned Spanish and only spoke Q’anjob’al, which is what my parents speak - that's harder to say because I think that because Spanish is predominant language amongst Latin American countries, you can all communicate, if that makes sense, with each other. It doesn't matter if you're Mexican, Guatemalan, Bolivian - you're all speaking Spanish and I think that's what forms, in my mind, predominantly, that Latino identity. If I didn't have access to that group because I did not speak Spanish, that's when I would start to question what my identity was, and I don't have a label for that because I haven't experienced it, so. JH: Okay. And you already started to lead into this a little bit, which is perfect. You keep leading into my next questions. What do you feel like you have in common, as a - however you want to identify yourself - as a Mayan, Guatemalan, and as a Latina, whatever - how do you feel like - what do you feel like you have in common with someone from Central America or someone else from South America? YV: The first thing would be the language. And so, because I do speak Spanish, and it is the national language of pretty much most of the countries in Central America or South America, I think that that's something that unifies me, as well as, I think the way I look. And - it's very much just this indigenous look, where - I mean even traveling to, not so much in Argentina - in Argentina I was lucky enough to be - so they have approximately 98 to 99 percent of their indigenous population has been wiped out and so it's very much become Europeanized. But up in the northern regions you will find still the traces of the groups of indigenous peoples. And I actually spent one my summers teaching English and basically doing construction and repair work at this small school, three hours outside of the closest city, and then - in the middle of mountains, and it was with one of the indigenous groups. And there, I fit in more than I did in Buenos Aires because in Buenos Aires, even if you're not naturally a blond, most of the women were dying their hair a lighter color and most of them were paler in skin. I got to northern Argentina in this rural community and everyone there was also, you know, moreno, like darker skin, dark hair, and I looked more like they did there. And I remember thinking that. Then I traveled after that to meet up with some friends to Ecuador and Peru, so we met up in Ecuador and then traveled to Peru. And they were both white. And so I met up with Austin and Amanda, and in Quito - I spent a day in Quito before actually meeting up with them. They'd gone for the weekend to the beach. And so I got to spend one day walking through downtown Quito and a lot of my clothing at that point, because I had spent two months in Argentina hand washing things - a lot of my clothing looked kind of a little more worn and used, and I walked around and even though I though I had a camera bag on me, it wasn't very obvious, and I felt perfectly safe. I walked around. I did some shopping. And no one ever batted an eye. I didn't get catcalled. I did not get harassed. I was just walking around perfectly fine. Even then the next night when we went out, when we finally did meet up, both of them went straight to the back seat - and even though I know it's not, like, the safe protocol to do, I sat in the front. I always sit in the front if other people take the back. I guess I just trust in the taxi drivers and the driver turns to me and he says, "O, eres su guía?" - am I their guide? And I thought - I laughed. I was like, "No, no, no, yo tambien estoy viajando con ellos," like, "I'm traveling with them." And we all laughed about it because Austin and Amanda were like, "Oh yeah, she's our guide. She's our guide." But this Ecuadorian man thought I was their guide because I came in and just started talking to him in Spanish, which is really cool. And then I go to Peru and again there's a larger indigenous population there and I mixed in with everyone else. So I think, like, in terms of relating to other people, I look more like people from other countries. We speak the same language, and then I think particularly for Guatemala, I always say that the food that we eat in the festivals at my community back home does, at least, very much keep this relationship with Guatemala and Mayan culture. I actually went home this past weekend to - to visit my family for the first time this semester and I lucked out because there was actually a Mayan festival where they usually have this girl named a reina, a queen, and she represents the Aguacateco community in our church. And so usually they appoint the queen, but this time they decided to make it more like a pageant like it really is in Guatemala, and the girls had to show grace, or like elegance, and performed in different skits or do different things. And there was a panel of judges who selected her, as well as a popular vote. And I was so proud to see all of, like, these six girls that are competing wearing their trajes, and like, the marimba being played, and women in the audience also wearing their trajes because they recognize that, like, it shows support. And I just stood back, and I even took a picture of it on my iPod. I was just really- it was one of those moments of like - it's such a beautiful culture and I'm so proud of that. So, and then my mom of course, like, packs me food and she's just like, "So, do you want my to pack you food?" She'd made molé and chuchitos, which are like a tamale, and I'm like, "Yeah," but I'm like running around getting things ready. I'd just done like five interviews that weekend, so literally I was hardly - I hardly spent time with her but she had made molé because she knew it was my favorite food, and she packed me my tortillas and my molé and they dropped me back off. JH: All right. Do you believe that Latino or Hispanic identity is something that's understood and shared by a wealth of people in the U.S.? Or is it - are these terms understood to be fictional identity labels that were imposed on them? YV: I think from my experience with my parents and with other community members, they know that their title is Latino or Hispano. They'll hear that in the media or anytime there's a survey taken, or the census, whatever it might be. They know that they should check off Latino or Hispano. But I think that if you were to ask them what they were or what they identify as, it would be their home country. As was mentioned earlier, you know, they probably identify more as Guatemalan or Honduran. And that would be their first answer, as opposed to Latino or Hispano. But they recognize that at the - that's the title given to them. But they - I don't think they view it as an imposition, which addresses your second question because I don't think there's this active consciousness of knowing that, wow, this title was placed on us by American lawmakers to classify us. I think that they just know that that's what they're understood to be, but they don't view it as, like, an active act - well that's redundant - but, an active action [laughs] - that's still redundant - by the government. If that makes any sense. And so they'll identify as Latino or Hispano, like they will respond to it, but I think if you ask them personally they would identify with their home country. More than say, "Oh, yeah I'm Latino" or "I'm Hispano." YV: Or custom, more than anything. They're addressed by that. Paperwork tells them that they're that. And so, out of custom they're like, oh, you know, then I must be - I must fall under the label of Latino or Hispano. But I don't think that that's a personal identity or label that they would place on themselves. They just know that that's what they have been called and so they'll respond to it, because they're used to responding to that. JH: What about you personally? Filling out paperwork and things like that. YV: I - see, I've had struggles with that lately because I usually indicate Latino or Hispano because it's the easier thing to do. And so just checking that box is easier for me to do that than it is to click other and put in - and type in instead Guatemalan or Mayan. And so it's easier to just go ahead and say Latino or Hispano. And I think as I mentioned last time - or, well, earlier in the interview - that I kind have this - I feel like I have this dual, or even triple, identity where I can be Mayan when I'm in that context, I understand what it means to be Latino - and that's more of a Pan-American, you know, identity - but I also know what it's like to live and understand the predominant, majority American culture. And so I can navigate all of those and I'm realizing, wow, I'd grown up doing it but I never actively thought about it until I started taking some more classes and - specifically focusing on Latin American culture and history, but I think also - like a part of my anthropology major is also looking a lot at identity and how different people identify themselves. And it's made me think, like, wow, there are three major cultural spheres that I have always grown up managing, and it's not a big deal to me because that's my- that's what I know to be. But I'm becoming increasingly aware of how cool that phenomenon actually is. So that knowledge comes with it the struggle of well, what do I put down when I have to identify myself? Do I put down Latino or Hispano? Should I clarify that I'm Guatemalan or Mayan? Or what? I just leave it as other, so. But, I usually tend to go with the easier response because, I don't know, it's just easier for me to click that and move on than to try to explain it. JH: Okay. Well, how about - do you feel like you belong - I guess, in your home community do you feel like you belong to a Latino/Hispanic community there? And, I mean, I know from prior knowledge that that's - you have a predominantly Mayan community in Morganton, and also Hmong, so is there any sense of Latino-ness in that community? Or not really? YV: Well, that's hard to say because the majority of the Guatemalans and Mayans who make up our community are immigrants, and so, as I'm saying, they would identify more as Guatemalan versus Latino or Hispanic. And I said earlier that, at least in my definition, being Latino connotes being more familiar with and growing up in a predominantly American context. And so that wouldn't apply to the people that are in my hometown because they didn't spend most of their life in America. They very much bring back and still have the beliefs that they brought from Guatemala. And so, to me, I would say that it's a Guatemalan community, or Mayan, but not - not really Latino. I think that - there are some Mexicans who come to church as well. They're a small group and they come usually on major holidays, or when they want their children baptized. And that's usually when we see them, but, it's like I said, and the people I mainly interact with are all Mayans. JH: What about in the youth, like yourself that were born in the U.S.? YV: Do I - that's interesting. JH: Is there a big community of youth, like your age, more or less, that were born and raised --? YV: Yeah, I think they would call themselves that. YV: Well, that's the thing. Because there's no distinction. YV: The reason I can make the distinction is because I've learned the different history behind the words. YV: But to them it's - because the census even says Latino or Hispanic. Their school exams say Latino or Hispanic, so they just say either one because it's the same thing to them. YV: What do you mean by the way I identify myself? JH: The way in which - I mean, the titles that you've applied to yourself. The way in which you feel like you fit in to others around you. Yeah, how do you feel like that's - how do you feel like you have evolved mentally to understand that? How has it changed? YV: I think in terms of my identity, I knew I wasn't white, if we're going to talk about race first. And I think that's the one that's most - is the first realization I made in terms of my identity. I knew I did not look like the other students in class who were predominantly white, and so - or African-American. And so, when I would be in class I did just as well as they did, and so fortunately for me academics - because I - although Spanish is my first language, I started learning English in elementary school in Kindergarten. By first grade I was pretty fluent. And so academically it was never really a problem because I could do just as well as the other peers but I always knew I didn’t' look like them. And I think that as far as I can remember, even thinking when I was ten or even eleven and twelve, I knew that my family - I think the first thing I came to identify with would have been Latino. And that's just because I spoke Spanish. And so a lot of times, like starting actually when I was as young as ten, I would accompany my dad to translate and interpret for anything. It could be a doctor's appointment. It could be to go talk to our insurance agent. And so he would just take me along, which is interesting because my older sister is two years older but she's the more quiet one, and so I was always the more out-spoken one. My dad used to call me a parrot. He's like, oh my gosh, you're just like a parrot. Like, stop talking. [Laughs] But, so like, I was always very outgoing to begin with and so I would notice thought that when I would go translate, it was just seeing my dad - like sitting there next to my dad - then you see usually it's a white person that we're talking to, whether it be the doctor or the insurance agent. And serving as an interpreter, I knew that we were some kind of other and that was probably Latino because that's the language that I was exposed to anyway. Within the school system, you're identified as Latino. And so I was like, oh, I speak Spanish. I'm called Latino in school, so, like, we're Latinos, we speak Spanish. And we're not like the majority, and so that's the first thing I realized. And then, as I got older - I mean, I always knew we're Guatemalan and so if anyone asked me specifically, you know, "Where is your family from?" I would say Guatemala. But as I mentioned earlier, there - it would have been my Junior year of high school that my youth group coordinator - well she - this woman in the church - and she's really cool herself. She's actually - she's from North Carolina. She's like white, southern. But she ended up studying Spanish in college and then moved to Bolivia, married a Bolivian man, and her children are bi-racial and she's come back to Morganton and she's bilingual at this point. She translates and interprets during the Spanish mass. And so growing up, I'd always see Maurine be at the front of church, and whenever my priest would give his homily she would translate for him. And so we became really close because she was an active member in the church. And so my family would invite her, like if we went out and had dinner, or just - everyone knows her, and she has so many God-children within the church because everyone like loves her because she's always wanting to help people or like will interpret or translate for them. And for a good number of the families, she was their sponsor to get their residency. And so my family became close to her just over time. And then she approached me and my sisters and, you know, said, "Hey, I want to start this youth group within the Guatemalan community. Do you want to help me start this?" And so, we were like, "Sure, why not." And during those sessions where we would meet, as we were starting up this youth group, we would learn about our faith - so we're Catholic - but she would also show us videos on Mayan culture. And she started to explain to us that, you know, "You're more than just Hispanics or Latinos. Do you realize that you're Mayan? That's why the women wear their traje. And like that's why you'll see the marimba being played and it's different from the Mexican culture." And I - you know, that's when I first started realizing, like, wow, it is different. And she got me thinking about that. And I left it at that. So I started being - you know, started to reconcile this notion that, oh, I'm more than just Latino, I'm also Mayan. And I knew that in high school, but it was never really strong. I just like had it in the back of my mind, but there's also never a place or space where I could just come out and be like, "Oh, this is our Mayan culture" because either it happened in the church and that was just standard and normal, so it was just something that I was used to, or there was never a chance at school where I really had a chance to talk about it because we didn't learn about it in school. And so you never learn about Central American history in particular. And so there was never a moment where I learned about it from an official academic source. And so, I go on to college and then I start taking classes in the Spanish Department here, as well as in the Anthropology Department and even the Anthropology Department at Duke, where I start learning about colonialism and just specifically Guatemalan history and the different dictatorships that did occur in Central America. And it just got me thinking, you know, wow, there's a whole civilization I've no clue about and know one really knows what happened to them except for the fact that they eventually migrated down to Guatemala and then the people, like my family, are descendants of these people who settled in Guatemala and we maintain certain - like the clothing is still made in a similar fashion and of course we're the people of the corn so we eat tortillas at every meal. And I started learning about that and I started realizing, like, I have this conflict with colonialism at this point because it's the reason that - well it's the reason for a lot of problems in the world - but, like, why a lot of this Mayan culture was wiped out. And why we even have racism, and why Mayans are currently oppressed in Guatemala and they're living in the poorest regions. And it just made me start thinking, like - you know, just learning about that made me start to feel, you know, a lot of solidarity with understanding why people immigrated and why I saw - like why Morganton even has so many Guatemalans there. And so, this feeling of solidarity made me more proud to identify as Mayan or Guatemalan because - specifically Mayan - because - I don't know, it's - you know - like to know that my parents immigrated, my dad never went to school and my mom went up to third grade. And her I am in college, and like, what kind of a privilege that is, and how lucky I've been in that - I don't know - that I happened to be good at school, that I had good mentors and good teachers that, you know - one of them, my third grade teacher, called out the fact that I shouldn't be in ESL. I spoke English correctly. And then she was the same one who then put me into the Academically Gifted track, which in and of itself puts you at an advantage above other people. JH: So, you talked about learning about colonialism here at UNC and really identifying with that struggle. Do you feel as though identifying as Latina gives or takes away from that struggle against colonialism? Basically, do you feel that by identifying as Latina you're kind of uniting with other Latinos around you in this struggle, this decolonization struggle? Or do you feel that it's basically taking the spotlight off of the struggle that was really borne by much of the indigenous people of Central and South America? So, you know - and the Mayans, as you kind of already said, are the ones that still today in Guatemala are really struggling the most as a result of colonization that occurred 500 or 600 years ago. YV: I - I think that the - in terms of colonialism, the best way that you can most combat it, I think - in terms of fighting or, yeah, fighting against colonialism. I'm sorry; I'm having a hard time speaking. You - I think it's good to start elevating Latinos in general as a whole. And I think that that's really pertinent, at least to me because I do live in America, that if we're going to start bringing indigenous issues to light we first of all need to just elevate everyone. It doesn't matter what group you belong to, but just start getting people into schools, getting educated, learning about their history. And then, together raising an awareness of this colonial process because I think a lot of people don't realize how much colonialism, and even racism, has created the worlds that they live in right now. So I think that, for Latinos at least in the U.S., we need to elevate ourselves and get educated and then from there we can branch off and celebrate our own indigenous pasts and cultures, and then that's how we would do that. So, I don't think that by grouping together as Latinos it's detracting from the overall mission. I think it can be very useful for educating people and raising this awareness and then people can create action from it. I think that it would be really hard to get all of these different groups that identify as indigenous, or whatever identity they might be - while I think it is important to celebrate them and keep that culture alive, it'll be a lot harder to mobilize people to create change and start reversing a lot of these systems if you're all fighting for, like, your own group and your own cause and not really coming together to work together to change things. So, I think that identifying as Latina can be very useful in that sense because you all can share that - the colonial history together and then push each other from that and push your own agenda. JH: Okay, thanks. I guess I have another question going back to what you were talking about, talking about how your identity has changed through - especially up until now through college. Going back to - you went back to Guatemala last year, was it? JH: And do you feel like being in Guatemala gave you some new perspective, some different insight - perhaps changed, yet again, the way you identify yourself or the way that you view yourself? YV: I think that going back to Guatemala was interesting because it allowed me to see two different sides of what being Guatemalan is. So I lived in Xela, which is a large city - at least for Guatemala. It has predominantly a Ladino population, which is the same thing as Mestizo, so mixed indigenous and European descent. But then you see, at least where I was working and doing my work with this clinic - it was in the Palajunoj Valley which is about a fifteen-minute bus ride outside of Xela. And then that's where you start seeing a lot of the Maya-Quiché communities and populations. And I think I was able to see both sides of just what maybe being Guatemalan means. And so I identified a lot with the Mayan communities because, as I've said earlier, I mean I feel like a large part of their culture is their food and what they wear, the way that you present yourself. And I saw, like, very much staple foods like rice, beans, tortillas with the Mayan community and so I saw that and I saw the trajes. And even though it's a different style than the one my parents wear, it's still the indigenous clothing and it was nice to see the kids still wearing that and seeing the families wear that. But then I would go back home - back home, or wherever I was staying in Xela and, realizing that I could very much identify with the Ladinos because they know Mexican music and Mexican culture because that's what's predominant there. Just like here in the U.S. I grew up watching pretty much Univision which is pretty much Mexican TV. And so I grew knowing all these different actresses, or just in general Mexican novelas and then Mexican pop culture in terms of its music especially. And so I'm familiar with that. And when I was staying with my home stay in Xela, they would talk about the same actresses I'd been watching for years, or even music, like artists. And so I could totally talk with them and carry on conversations as if I'd grown, you know, grown up there - I knew their popular culture at least. So I think that in terms of my identity it allowed me to see how I can dip into both and understand one side but also understand the other - be familiar with both. And I think in terms of comparing myself to the other volunteers who were American - one was Asian. She was Chinese but was born and raised in the U.S. And then one was African-American and the other was, you know, just a white American from Arizona. And to them, the Mayan culture was very exotic and they kept saying, "Oh my gosh, the trajes are so beautiful" or like "Oh my gosh, I love tortillas." And I had the opposite - I mean, I didn't have the opposite, but that awe with like the culture, like the indigenous culture was something I'm already familiar with. And so it like re-ified, or just like made me feel comfortable with knowing that, hey, I'm familiar with this culture. But then going back to my homestay, and eating more Mexican style meals, like tacos and garnachas, or papusas even. I was like, oh, okay, I'm familiar with this culture as well. So I think it showed me that - it just showed me the different identities that I do have. And that - yeah, it's very multi-faceted, so it's not just one. It didn't polarize me into saying, "Oh, I'm more Mayan than I am Ladino or Latina even," if you want to say. If we're going to use Mexican pop culture kind of as this medium through which you identify being Latino, then no, it did not polarize me. It showed me like, oh cool, you can navigate between these two worlds and it's your norm - it's what you know. JH: Do you think Mexican pop culture is the means by which you identify as Latino? YV: I think in the U.S. a lot of it is just because the media is predominantly. Like your major channels. Telefutura, Telemundo, Univision. They're all very Mexican based, and so what you see on there in terms of the news reporting, the novelas, is Mexican pop culture. So yeah, I think that - like everyone can talk about Jenni Rivera for example, a famous artist who died a couple months ago, and everyone's going to know who Jenni Rivera is because she was a big name in Tex-Mex music. You know? So like you share that over that. Because you have no other option. That's what's available when you're growing up. That's what your parents are watching because it's in a language they understand. And they even grew up hearing some of these names and it played on the radio back in their homes, whatever their native country might be. So you're familiar with these kind of big Mexican names just because that's what is available. YV: Or grew up in an American context. JH: Speaking Spanish. Yeah, thank you. And right now you're talking a little bit about how Mexican pop culture has influenced this Latino identity. And, I mean, I think that's something that you left out earlier and now you're bringing it in because you're realizing it. How relevant do you think it is? I mean, is this title Latino/Latina - does that really come from and is it an extension of Mexican culture in the United States? YV: I think a large part of it is based on Mexican culture because, now that I think about it, if we think about the first Latinos in the U.S. - and really they identify more as Chicanos even, which is its own category - but, you know, Chicanos are pretty much Mexican-Americans. But a lot of the people who were the first Chicanos, even, were Mexican and when they were incorporated into American territory they suddenly became Mexican-Americans. And so this identity was imposed on them and eventually it's become this Chicano identity. And so if that's the first population of Spanish speakers and people from Latin America that are living in America, then they're the largest population in the culture that they bring back from sharing either between sister cities or twin cities, or even their hometown or what they remember. If that's the basis that you're creating these media networks and, like, what's found in Mexican stores and, like, what they're familiar with because they were the first ones to be here and start building these enterprises or networks - and then you start seeing people come in from other countries like Guatemala, or Honduras, or El Salvador. They - I can see how when they come in, yeah, you might have their own particular culture, you know, their - or like they'll still have their own foods that they claim as regional to themselves or particular ways of speaking, even dialects. But, the first one that's established and, like I said, that you'll find in the media is Mexican because that is still the largest population and that's what has been established for the longest time. So, because it's so pervasive it does filter out into the other different communities. And that's how I can see Mexican culture and media kind of making - putting its fingerprint, you know, almost on these different - these other different groups. And so it adds, I think, to what they bring to the table. And maybe over time, as other populations grow and they enter the scene and, who knows, maybe - I mean, for now I don't foresee the Mexican population decreasing or, you know, out of all of the Latin American populations I think they will probably always be the largest because of their proximity and their historical background. But, yeah, I could see why it's the basis. And I would say it is. And slowly you're starting to see the incorporation of channels or TV that is streamed from other home countries, so there is a Guatemala TV that you can find on Dish Network or Direct TV, but it doesn't compete with these big Mexican chains such as Univision and Telemundo. YV: So that's what you'll see be most pervasive amongst groups. JH: All right. Well, are there times when you feel that you must explain your identity to people who seem to have little knowledge of your actual origin? So maybe more recently in your life when you started to identify as Mayan more, do you ever find yourself in situations where you feel like you can't say Latina because you're not - you're leaving a lot out and that person is not really going to understand what you are and so therefore you have to go into a lot of detail or explain really who you are? YV: I think - I think so. For most people, if I said Latina, I think that they would take it. A lot of people would just be like, "Oh, okay, whatever" or "Yeah, she's Hispanic" because I don't think that in general, amongst American society, there is this consciousness of the difference between the two. But I think most people would either let it go, or if someone asked me, you know, "Well what kind? Where's your family from in particular?" then - for so long, and I even do it now, I'll say Guatemalan because that's what I'm used to saying first is Guatemalan because Mayan is the newest identity I've managed to be aware of. So, I'll say Guatemalan first out of habit. When I think about it though, I think it also makes sense because if I said Mayan I would have to be more specific. My family in particular is Maya Aguacateco because they speak Aguacateco. But if I just said Mayan in general, there are at least - at least, well, official recognized there are 22 different Mayan languages hence Mayan peoples within Guatemala itself. If you include the Yucatan peninsula, that's another dozen or so. So you're having at least 34-35 different Mayan populations and peoples existing, and so if I just said, "Oh, I'm Mayan," that's grouping all of them together and not recognizing that, hey, they're different groups within themselves too. And then that would just be a whole different explanation. And in everyday life it's not conventional to say, "Oh, I'm Mayan," and then have to go into the specifics of, well, which type of Mayan am I because it can refer to - even in Mexico and Guatemala - it can refer to different countries. And even Belize, we have Mayans in Belize. So, it's hard for me to say Mayan because Mayans are found in any of those three countries. So the more specific answer is Guatemalan. JH: So, I'd like to explore a little bit more both, I guess, Latino - the words Latino and Hispanic because you have touched on them and you really gave your own definitions of each of those. But I'm just wondering if there's other things that tie into them as well, things that you haven't mentioned, such as religion, food, other cultural aspects. You really hit on language a lot, and so I'm just wondering if there's anything else that you feel like ties - that does tie into it as well? Or no? YV: So, yeah, you're right. I've focused on language, as well as where you were born or what your descendent - your heritage is, your cultural background is, or racial background, ethnic, whichever word you want to use. The - you mentioned religion. And for the majority of Latin America people do identify as Catholic but I have a harder time saying that that's a unifying force amongst Latinos. I think in general, believing in God and Jesus, like Christianity would be the more unifying force. But, I just know that from where I've been - especially in the U.S. - if we're talking about the U.S. context, you're starting to see a lot more Protestant Latinos who are - identify as Baptist or Pentecostal. So you're seeing these different groups and sections emerge, and so I don't think that you can - with this emergence of different congregations and groups, I don't think that you can say that Catholicism would be the one religion that they're all going to fall under because they don't. And that's happening at a faster rate I think. In general, the Catholic Church is losing a lot of members to different groups. So I wouldn't say Catholicism, but I do think that there is something to say about Christianity and, you know what, I'll say it - it's a factor of colonialism itself too. And so, this Christianity that was brought over from the Spanish is, I think, still very much engrained amongst Latinos in the U.S. but also people in Latin America. I mean, when I was in Argentina, Ecuador, and Peru, and then Guatemala, you can't walk around without finding some kind of church. Usually it's a Catholic church, so I think in Latin America Catholicism still has its greatest hold there. In the U.S. it's starting to lose that hold amongst Latinos, but I think overall though, there's very much still a strong sense of Christianity and spirituality that - whether or not you all identify as one particular group such as Catholics, you will still always see people, you know, praying to God, being very devout. And even if they don't go to church every week - it's almost - you know, I've never - I've rarely - I won't say I've never, but I have rarely met a Latino, at least in the U.S., who is not some kind of Christian. And if you're not then it's like wow! You don't believe in God? What? You know? So, they do believe in - I think that Christianity itself is very much - could be a uniting force. And I think in general you could say it’s a trademark of Latino populations, and Catholicism more so in Latin America. JH: Okay. Is there anything else that you'd like to add? YV: About anything in particular? JH: No. Just as we wrap up, anything else that you feel like you would've like to mention? YV: I think that - I think that it's going to be really interesting to see how other younger generations identities develop. And that's something I'd personally like to study more because I know at least within my own personal context, I'm the first generation born in America. And so, all of the knowledge I'm learning and the identities that I'm forming are things I'm figuring out by myself. And my parents wouldn't be able to relate to that. And, you know, if they spoke on my behalf and had to say what my identity is, they'd probably say I'm Guatemalan or Mayan. You know, they probably wouldn't really say Latino - I really don't know what they would say because, like I said, these are the three big ones that I identify with. I don't know what my parents would say, but we don't talk about this. And this type of discourse is not one that I have with them because they had no formal education so engaging in this type of conversation is one that they would probably talk about, but it doesn't seem as pertinent or as interesting to them is what I'm assuming. I could be wrong, but that's the assumption I have right now. So I think it'd be very interesting to see even my own children, or the people who come after, to see how their identities are formed and if eventually - even though they may look Latino - they will begin to identify as just solely American. Or if they'll maintain that Latino identity. And that might depend on the language or how much they’re exposed to the culture, even if it's just through TV or the food. So, we'll see. But I think that that's something that I would like to keep track of over time, because it will be changing depending on how long people will be here. And immigration reform could do a lot in terms of that too, and how many people end up staying here and for how long. JH: Yeah, that's really interesting what you bring up. Well, Yesi, thank you so much for allowing me to interview you. JH: You're a very interesting case. Very - very specific case. And it was very nice to hear your personal stories and I appreciate you sharing them. 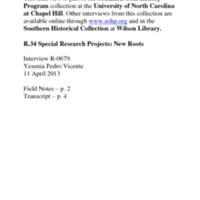 Interview with Yesenia Pedro Vicente by Joel Hage, 11 April 2013, R-0679, in the Southern Oral History Program Collection #4007, Southern Historical Collection, Wilson Library, University of North Carolina at Chapel Hill.